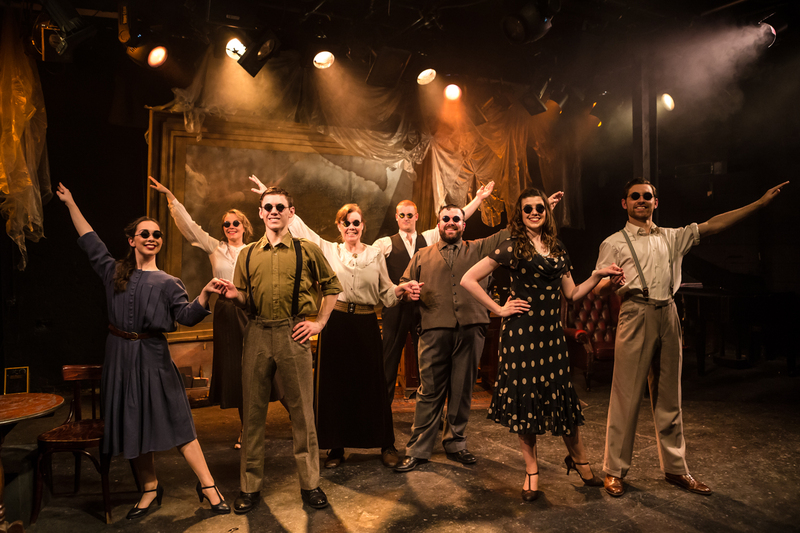 Stephen Sondheim's Road Show pulls in to Union Street this week for a February residency. It's a curiously intriguing tale, part fact part fiction, inspired by the real life architect Addison Mizner, who with his brother Wilson, was to build the southern Florida city of Boca Raton, a development of luxurious haciendas, populated by America's wealthy elite. Of course there's more to Sondheim than just property development - and as Addison finds himself drawn to his (fictional) gay and wealthy patron Hollis Bessemer, so does Willie lurch from gambling to prize fighters, to boxcar-riding destitution, before re-uniting with his brother to build the coastal city. Whilst it’s certainly an imaginative production from Phil Wilmott, on occasions too much is left to our imagination. (Those screwed up balls of newspaper for instance?) An upstage framed gauze, suggesting vistas beyond our view, works well in the occasional back lighting of characters, but muffles the sound of those singing behind it. And in playing Addison, whilst Howard Jenkins captures his character's frustrating strive for integrity, he lacks a vocal impact, which for a lead role makes it hard for us to empathise with his journey. Andre Refig's Wilson meanwhile convinces us of his reptilian talents, the two brothers expressing a clearly inescapable sibling dependency. There are nuggets of excellence amongst the company. Steve Watts' Papa Meisner is an assured pater-familias with a deliciously sonorous tone - likewise the accomplished Christina Thornton who in an array of ensemble roles brings a touch of old-school class to her singing. Joshua Le Clair, impressive in last year's She Loves Me, does it again as Addison's effete "mark" Hollis, his big number Talent proving a treat. Also notable amongst the ensemble are Damian Robinson's prize fighter (blink and you'll miss it) and Amy Perry's Myra. Its early days here and if all the company were to emulate these actors' vocal power, the show will become a lot closer to the exciting roadster Sondheim intended it to be. In a long haul (1hr 45 with no interval) Richard Baker's 3 piece band, playing virtually throughout, offer a fine if economic interpretation of the score - and credit too to Thomas Michael Voss' choreography. For the show’s big ensemble number Boca Raton and aided only by strong lights and sunglasses, his routine neatly suggests the privileged playground. With a contemporary punch at the finale, Wilmott offers us food for thought. And in giving us a glimpse of some of tomorrow’s musical theatre talent, Road Show will certainly entertain Sondheim fans.